Crown Hill is the city’s premier Victorian-era cemetery, and the final resting place of most of its leaders from the 1860s to the present. The cemetery is also important for its Romantic landscape design and architecturally significant buildings and structures. Indianapolis had only cramped, traditional Greenlawn Cemetery downtown in its early history. In 1863, a private board formed and bought the site of Crown Hill. The group hired John Chislett, landscape architect and cemetery superintendent of Pittsburgh, to design the grounds. Using the Victorian Romantic landscape ethic, Chislett retained many natural geographic features and laid out meandering roads that complemented the site. Over the years, Crown Hill became the choice of nearly all who could afford private burial. During the Civil War, old Greenlawn Cemetery filled rapidly with Union and captured Confederate dead. 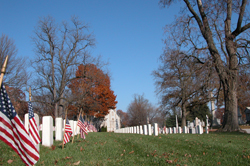 In 1866, federal authorities requested a portion of Crown Hill Cemetery to be set aside for Civil War internments. The government bought 1.4 acres and laid out an arc-shaped lot. Artillery pieces and a circular walk surrounding a flagpole commemorate the fallen soldiers. This portion of the cemetery has been listed separately in the National Register of Historic Places. The gates to the main entrance of the cemetery are on Boulevard Street. 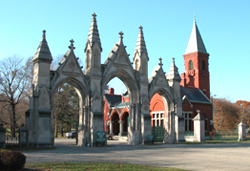 Adolph Scherrer was still supervising the construction of the Indiana Statehouse in 1885, when the cemetery board hired him to design these fine Gothic Revival limestone portals and matching gate house. The Waiting Station, also designed by Scherrer in 1885, is the red brick Victorian Gothic building just inside the gates. The Waiting Station features contrasting brick, limestone Gothic piers, stone lintels and sills, and red terra cotta wall tiles. Before the advent of interurbans, trolleys, and autos, the Waiting Station provided a suitable place for family members to gather while waiting for others to arrive by carriage. Further inside the grounds, Dietrich Bohlen designed a stone Gothic Revival chapel in 1875. The chapel is one of few buildings left in Indianapolis designed by the elder Bohlen, who is thought to be the first trained architect to live in Indianapolis. The interior has a true masonry pointed arch barrel vault. Crown Hill’s tranquil landscape is replete with excellent funerary art and sculpture. Elaborate mausoleums in Romanesque Revival, Neo-Classical Revival, and Art Deco style can be found on the grounds. The roads through the cemetery wind informally through grassy meadows and clumps of various species of trees. Crown Hill Cemetery is located on the near-northwest side, at 700 W. 38th St., main entrance at 4302 Boulevard Place, 34th and Boulevard Place. The cemetery is open 8:00am to 5:00pm daily offering tours and well-marked routes to points of interest. Call 317-920-2644 for more information. Follow the signs in the cemetery to Riley Memorial, which is located at the highest point of the cemetery, for a peaceful view of downtown. INDYGO bus line from downtown: #28 St. Vincent’s, disembark at 34th St.; walk west to Boulevard Place gates. Crown Hill Cemetery Office Building, Crown Hill Cemetery Gateway, and Crown Hill Cemetery Chapel and Vault have been documented by the National Park Service's Historic American Buildings Survey.